Evanston Police Department announces traffic initiative on Ridge Ave.
A car moves near the intersection of Ridge Avenue and Greenleaf Street. Evanston Police Department announced Tuesday a traffic initiative aimed at reducing crashes in the area. 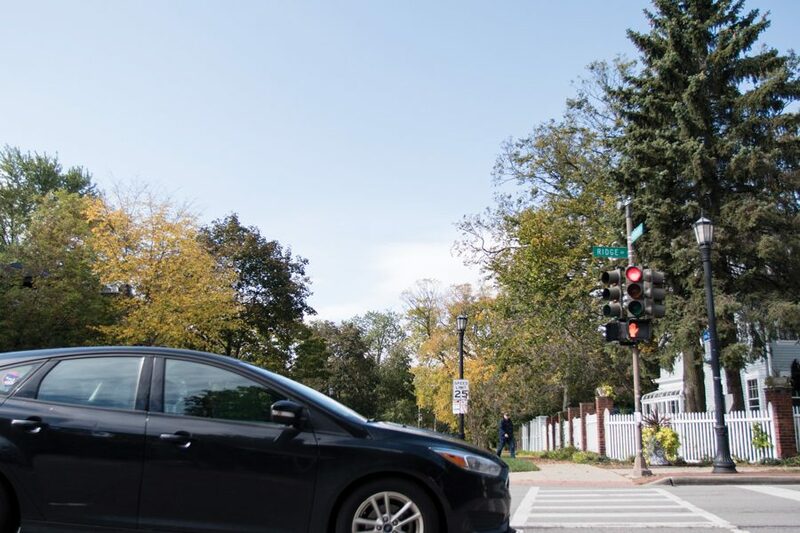 Evanston police began monitoring traffic Wednesday along Ridge Avenue, especially from Greenleaf Street to Davis Street, kickstarting a new initiative aimed at reducing crashes in the area. The initiative — coordinated by Evanston Police Department, traffic engineers and other city officials — was created to address an uptick in accidents and complaints of aggressive and distracted driving, EPD traffic unit supervisor Sgt. Tracy Williams said. The number of traffic crashes at the intersection of Ridge Avenue and Greenleaf Street increased from 12 in 2016 to 20 this year as of Tuesday, according to an EPD news release. Williams said EPD wrote 80 traffic-related tickets over a six-hour period Wednesday, 60 of which were written for distracted drivers. He said many of the drivers were using cell phones, and one was using an iPad. Five drivers illegally drove through red lights and three red light tickets were written, Williams said. He added that officers will monitor the area on and off as they search for a solution to the traffic problems. Ald. Donald Wilson (4th), who helped create the initiative, said the city should address the issue holistically. Making changes in one place could force aggressive drivers to take a different route, possibly causing problems down the block, he said. Still, he said making drivers aware of the dangers of reckless driving is the first guard against traffic accidents. Lara Biggs, chief of the city’s Engineering and Capital Planning Bureau, said officials have been looking at Ridge Avenue for the last few years due to the high volume of accidents that occur there. She said the city implemented solar-powered speed radar signs along Ridge Avenue to encourage people to slow down. The city also banned left turns during peak traffic hours at certain intersections between Greenleaf Street and Davis Street, Biggs said. She added that the move would help reduce accidents, many of which stem from left turns onto busy roads. “In the long term, we may also want to look at modifying signals at Greenleaf and perhaps other locations like Lake Avenue, to allow for left turn-only signals,” Biggs said. But doing so could prove difficult, Biggs said, because the lights on Ridge Avenue are part of a larger system of 21 timed, coordinated signals. Wilson said he plans to collaborate with local schools to create an educational opportunity. He said the collaboration would teach kids about safety concerns when walking or biking in congested areas. Despite all these traffic initiatives, however, Wilson said the main responsibility rests on drivers. Colin Boyle and Rishika Dugyala contributed reporting.